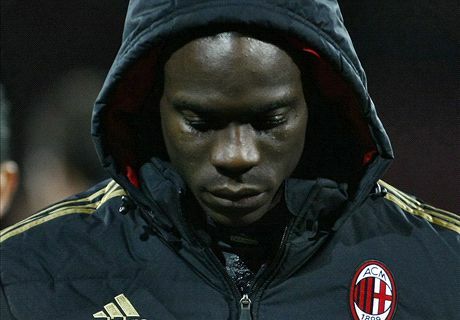 Clarence Seedorf has admitted AC Milan are a long way from the top of world football and says the same applies to his star striker, Mario Balotelli. The Rossoneri sit 11th in Serie A – 31 points behind leaders Juventus – ahead of Friday’s game against Bologna after losing 3-1 to Napoli last weekend, a game which saw the Italy striker reduced to tears after being substituted in the second half. The striker has scored nine times in 17 Serie A games this season, compared to his stellar 12 goals in 13 Italian league games last year, and Seedorf says the former Manchester City forward still has work to do to be a world-class wonder. “Mario is a great talent and we hope he can explode and become the champion that he still isn’t yet,” the Milan coach told reporters. Seedorf was reluctant to criticise former boss Massimiliano Allegri despite saying he is taking over a team that is in need of major surgery all over the pitch. “It will take time to get things right because we have a lot of hard work to do,” the Dutchman added. “I know what it is we have to do and we are our own biggest critics at the moment. “There is a great desire to take Milan back up to where they should be, although we all know it will take time. Criticising the previous coach is not something that interests me but the team does need to improve all over. Despite Bologna sitting down in 16th-place in the table, Seedorf insists the visitors to San Siro will represent stiff opposition for Milan and lamented his lack of centre-forwards available. “Bologna are a team who deserve a lot of respect and who won away to Torino,” he said. “We need to pay attention to their strengths because they are a very organised team. After Friday’s match, Milan will turn their attention the first leg of their Champions League last-16 tie against Atletico Madrid on Wednesday at San Siro.